Water is an important, but often overlooked, nutrient. Livestock water requirements are affected by many factors, including size, productivity, diet and environmental conditions. Good water quality and cleanliness can increase water intake and improve livestock production. Water quality and quantity may affect feed consumption and animal health. Low-quality water normally will result in reduced water and feed consumption. Substances that may reduce palatability of water include various salts. Salts may be toxic at high levels. Substances that are toxic without much effect on palatability include nitrates and fluorine, as well as salts of various heavy metals. Other materials that may affect palatability or toxicity include pathogenic microorganisms. Water pH denotes alkalinity or acidity. High-saline water is not the same as alkaline water. A pH of 7 would be neutral; a number higher than 7 indicates alkalinity; below 7 designates acidity. Most North Dakota waters are mildly alkaline, with a pH value between 7 and 8. Acidic water (pH below 7) is not common in most of North Dakota; however, some reports indicate acidic water in the western part of the state in proximity to lignite coal veins. High alkalinity may cause digestive upsets, laxative action, poor feed conversion, and reduced water and/or feed intake. Salinity refers to salt dissolved in water and is expressed as parts per million (ppm) or as milligrams per liter (mg/L). The term “total dissolved solids” (TDS) often is used to denote the level of water salinity. TDS is a nonspecific indicator of water quality. TDS levels should not be used as the only measure of water quality. Specific water components should be measured to determine suitability for specific applications. Salts commonly present include carbonate, bicarbonates, sulfates, nitrates, chlorides, phosphates and fluorides. Highly mineralized waters (high solids) may not impact health parameters because cattle do seem to adapt. However, pipeline breaks and produced water or brine water spills are not uncommon in rural environments. These contaminants can include very high concentrations of salts, from several thousand to more than several hundred thousand ppm (milligrams/kilograms) of salt, especially sodium chloride. Higher salt concentrations in water actually may increase water consumption; however, concentrations that lead to refusal to drink can lead to overconsumption when animals become too thirsty. Animals will have differing tolerance levels to salt content, depending on species, age, season of the year and physiological condition. Generally, animals will tend to avoid high-saline water sources but will ingest poor water if it is the only water source available. Clinical signs of salt poisoning are weakness, dehydration, tremors, aimless wandering, ataxia, seizurelike activity, partial paralysis and death. The prognosis is guarded in animals with clinical signs from salt toxicity. Cattle can die within 24 hours after the appearance of severe clinical signs. Treatment is available for salt poisoning in animals, so contact your local veterinarian. When animals have clinical signs from exposure to high concentrations of salt, avoid giving the animals access to all the fresh water that they will drink. Slowly return the animals to normal water hydration during a two- to three-day period. For large animals, water intake should be limited to 0.5 percent of body weight at hourly intervals until hydration is normal. Table 1 shows the health effects associated with the consumption of different levels of total dissolved solids. Table 1. Recommendations for livestock water used based on total dissolved solids (TDS). High levels of sulfates can impact livestock health. Ruminants are especially susceptible. Sulfate recommendations are less than 500 ppm for calves and less than 1,000 ppm for adult cattle. High levels of sulfate can reduce copper availability in the diet. If copper deficiency is suspected, water sources should be analyzed for sulfates. Use caution in evaluating sulfate levels in water because of interactions with copper and molybdenum. Elevated levels of sulfates may cause loose stool, whereas very high levels of sulfate can induce central nervous system (CNS) symptoms. High levels of sulfates also may contribute to and increase incidence of polioencephalomalacia (PEM), a brain disorder found in cattle. Water hardness is caused by calcium and magnesium. Softening the water through an exchange of calcium and magnesium with sodium may cause problems if the water already is high in salinity. When a significant amount of calcium is in water, it should be considered as a part of total mineral intake. However, many mineral salts are relatively insoluble and pass through the body without being absorbed. Even in hard water, the amount of mineral ingested from the water is not likely to be substantial. Water may be a source of toxic levels of nitrate for livestock. Water may become contaminated by fertilizer, animal wastes or decaying organic matter. Shallow wells with poor casings are susceptible to contamination. Marginally toxic levels of nitrate in water and feed together may cause nitrate toxicity in animals. Remember to consider both sources of nitrate. For more information regarding nitrates and nitrate poisoning, refer to NDSU Extension publication “Nitrate Poisoning of Livestock” (V-839 Revised). Algae that builds up in large livestock tanks or ponds may be due to a specific species known as cyanobacteria (sometimes called blue-green algae). It responds to sunlight and appears in stagnant water during hot, dry weather. Signs of cyanobacteria toxicity in livestock are diarrhea, lack of coordination, labored breathing and death. Many water sources contain microorganisms. Most microorganisms are quite harmless, but some do cause animal health problems. Coliform counts below 50 per milliliter of water are safe for all cattle. Other possible contaminants include bacteria, parasites and viruses that will not be reflected in the coliform count. Microorganisms can enter a well that has improper surface protection. A well is situated improperly if it receives drainage from livestock pens or a manure storage structure. Cracked well casings also may allow bacteria to enter the water supply. Contamination also may occur from a heavy spring rainfall. In addition, trotect the surface of wells from contamination by rodents. Many other chemicals, some of which could be detrimental to livestock production, may be found in water. Safe levels of herbicides and pesticides in water for animals have not been determined. Fish are more sensitive to pesticides than other livestock. Herbicides and pesticides can enter a ground water or surface water supply from runoff, drift and accidental spills. Provide adequate drainage around the water supply. Wells should be on elevated ground to prevent surface runoff in to the well. Livestock often coexist in the same environment with industrial development. Livestock producers need to be aware of sources of industrial contaminants, particularly petroleum related, that can be released to the environment, especially water sources. Animals can be exposed to fresh and weathered crude oils, refined hydrocarbons (for example, gasoline, diesel fuel and other petroleum-based products), concentrated and diluted hydraulic fracturing ingredients, glycols (for example, ethylene and diethylene glycols), methanol, produced water (brine or formation water) and oil field wastes. The sources of these exposures may occur from pipeline spills, broken equipment and offsite leaching, inadequate or broken fences and accidents. Livestock, particularly cattle, are curious and often will explore novel sites and ingest contaminated water, soil and forages. Cattle actually will seek out and ingest petroleum hydrocarbons and lead-containing batteries, and lick at greases and salty-tasting contaminants. Acute and chronic clinical signs occur in livestock following significant petroleum ingestion. Signs may include diarrhea or constipation, bloat, poor rumen motility, nervous system signs (tremors and seizures or incoordination and depression), and poor appetite with chronic wasting and marked weight loss. Respiratory signs, including rapid, shallow breathing, coughing and pneumonia, often occur. Following ingestion of moderate to large amounts of hydrocarbons, animals may vomit and aspirate contents into lungs and subsequently develop aspiration pneumonia. Reproductive effects have been reported with petroleum hydrocarbon toxicity, including abortions, dystocia, poor mothering and abnormal development. In addition to reproductive and production losses, death can occur days after petroleum hydrocarbon exposures. Immune suppression and secondary infections also are associated with livestock losses due to petroleum hydrocarbon toxicoses. If exposure to industrial contamination is suspected, immediately remove livestock from the contaminated area to stop further exposure. Provide the animals with uncontaminated fresh water and adequate feedstuffs. Contact a veterinarian. The local veterinarian, often in contact with specialists with experience with toxicants, can diagnose and initiate a treatment program. With significant petroleum product releases to the environment, the state departments of oil and gas and environment, and the state veterinarian are notified and will begin assessment of the contaminated environment and may assist with assessment of the animal condition. Do not allow livestock to return to contaminated areas until appropriate cleanup procedures are taken for protection of livestock. Long-term monitoring of contamination in the environment may be required to protect livestock. 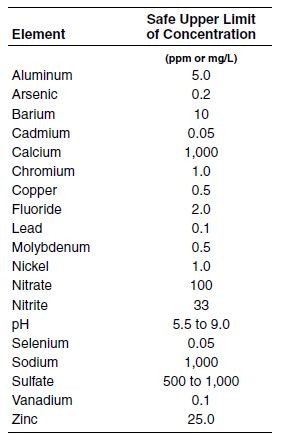 Table 2 lists the safe levels of potentially toxic nutrients and contaminants in water for livestock. These should be analyzed only when you have good reason to suspect their presence at excessive levels. Table 2. Safe levels of potentially toxic nutrients and contaminants in water for livestock. 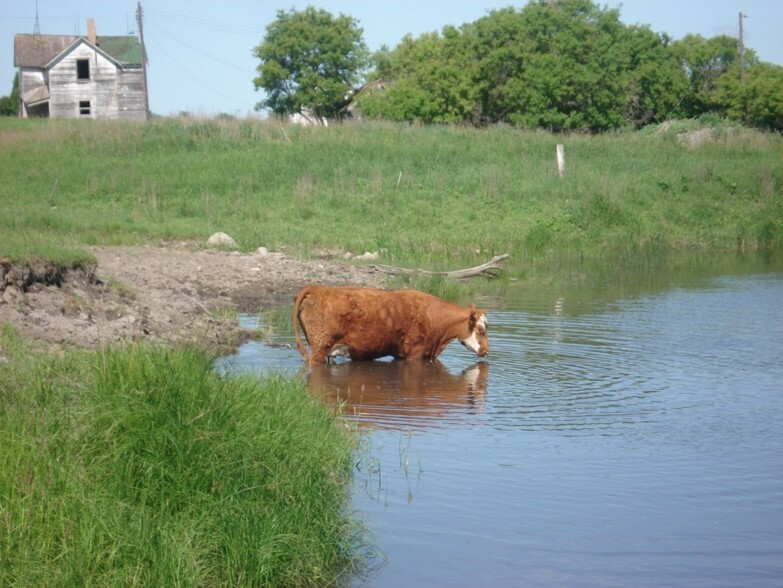 Annual testing of livestock water sources is recommended, particularly: 1) if using shallow water sources (ponds, sloughs and shallow wells), 2) during drought and 3) if you suspect a problem with water quality. Depending on the type of testing, a private individual may be able to take a water sample for water testing or the sample could be taken by a qualified individual for a specific set of tests. Sample bottles may be available from a laboratory for use in specific tests or, in some cases, empty distilled water or water bottles could be rinsed with water from the suspect source and used to collect a sample. The container should be sealed with tape. The best approach is to contact the testing laboratory to determine the sampling and handling procedures for the requested tests. Often water testing needs to be performed within a specified time period, so keep in mind transportation to the laboratory when taking water samples. No legal limits have been established for bacteria, or more specifically coliform bacteria, in livestock water except for dairy operations (Grade A dairies). For dairy operations, the water supply must be tested microbiologically safe for use by an approved laboratory.